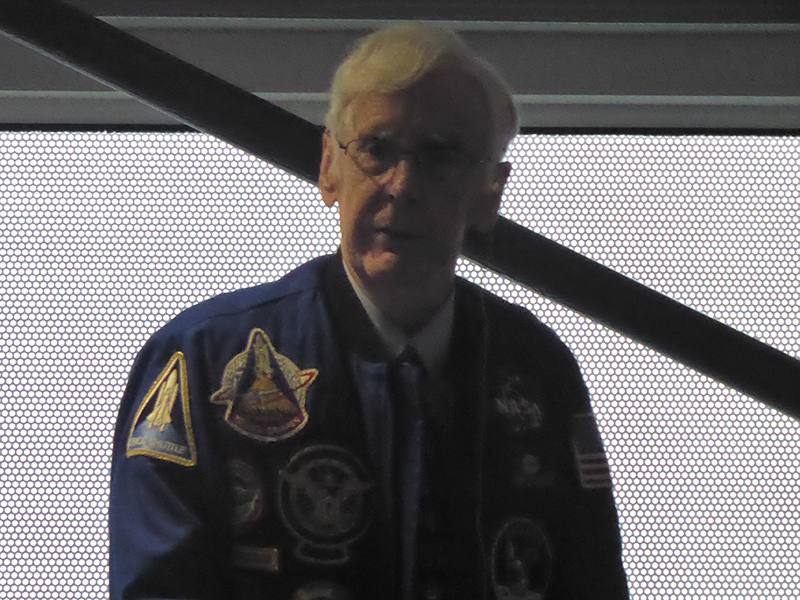 Jerry Bostick is a former NASA flight controller who worked in Mission Control during the golden age of spaceflight on Mercury, Gemini, Apollo and Skylab programmes, I’m meeting Jerry Bostick at the National Space Centre in Leicester for a lecture and Q& A session. Jerry served in The Trench, the group responsible for the trajectory of the spacecraft, serving as Retrofire Officer and Flight Dynamics Officer (FIDO). 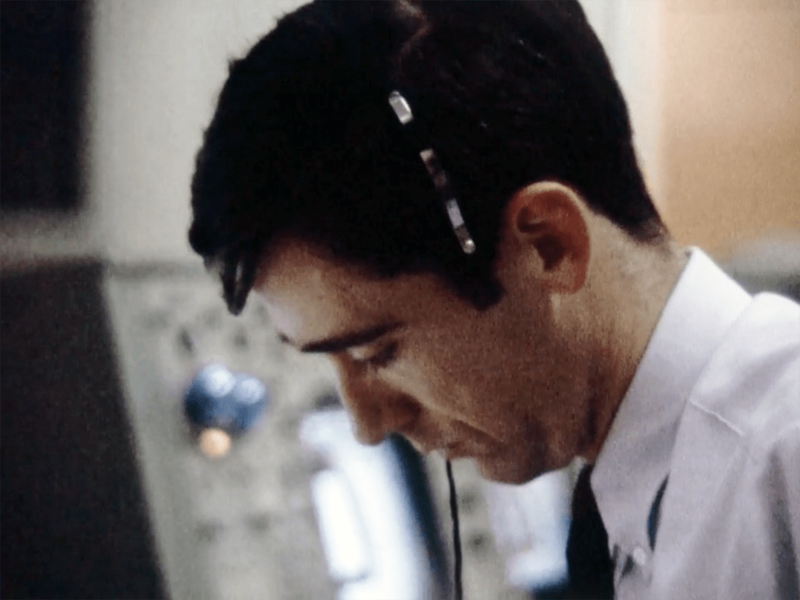 Jerry Bostick was also a technical adviser on the Apollo 13 and Armageddon movies, From the Earth to the Moon TV series and one of the unsung heroes featured in the recent Mission Control documentary film. What I’d like to do today is to tell you about the small role I played in the Apollo programme and what flight controllers really do, and what the whole of the free world accomplished, what we got from it and how we were able to do it. Mission Control used to be in what was called Cape Canaveral now called Cape Kennedy. 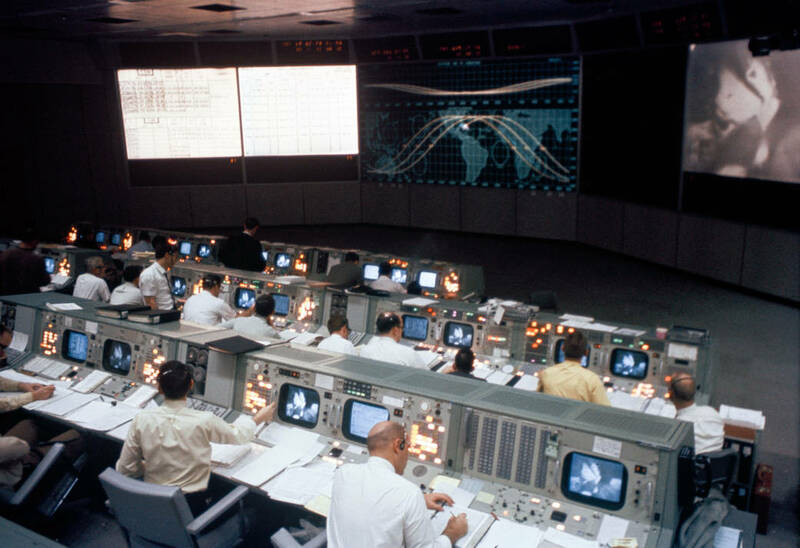 It was really just two rows of consoles, the systems people would sit in the front room and would worry about the hardware in the spacecraft, the plumbers and the electricians, and the people behind were the flight dynamics team who worried about trajectory and guidance. The world map you can see at the front, has wires that would describe the orbit and a little spacecraft model that travelled along. the plot board were only really used in the launch and entry phases. The computers that drove all of this were in Greenbelt, Maryland,100 miles away. The Retrofire officer s and Flight dynamics officers were in what we called The Trench. Then we went to Houston, Texas, which was a much bigger control room. The front row became the Flight Dynamics row, it became know as The Trench because it was a tiered operation, it was the lowest tier, Chris Kraft called us the front line of manned space flight. The systems guys and the Doctors were behind to the left. 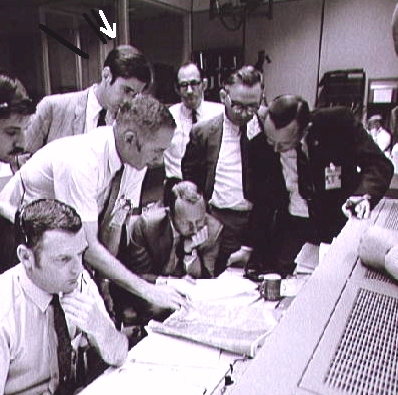 You’ve probably heard of John Aaron and Sy Liebergot on EECOM behind and behind them was the Flight Director row where Chris Kraft and Gene Kranz etc and management. They called call up displays but could not directly impact the computer. The Flight Dynamics team in The Trench were sometimes called the ground pilots. The Mercury spacecraft had no computers, Gemini had very little and Apollo had a little bit more. We would complete all the maneuvers they would have to make, rendezvous, orbit, trans lunar injection burns, lunar orbit insertion, any changes to orbit. We calculated them on the ground and then patched the numbers up to the crew for state vector maneuvers, coordinated for when they would start to burn, the attitude of the spacecraft it should be in which they could then set up on their on-board computer and set to automatically start. They didn’t do this all by themselves. The Mission Operations Control Room (MOCR) was surrounded by staff support rooms. Each of the major consoles had a staff support room. There was a spacecraft analysis room and in there were programme management level people, not the managers themselves, they would be on the back room on the MOCR. the programme manger and the head of the contractors, North American Rockwell, Grumman were all back there. If we had a question, we would ask our staff support room. We would write out a request and submit it to the spacecraft analysis room who would try to answer it. They would send it via runner to the Mission Evaluation room in an other building. They had all of the systems managers and engineers who built the hardware, who really understood it. They had access to spacecraft drawings, test data etc and had contact with all the sub-contractors. All in all it added up to about 400, 000 people. The head of the Mission Evaluation Room was the Apollo programme test officer Don Arabian, often called Mad Don, he had a short temper and intolerance for other people who weren’t as smart as he was and had a totally different approach to testing with the contractors. The contractors wanted to test everything against specification requirements from NASA, his approach was to test to make sure it would do what it was supposed to do. He was a very valuable asset. The messaging system was by P Tube (pneumatic tubes, you would use that to send messages to the computer room in the first floor etc. Any displays that we had on our consoles, we could hit a copy button and someone would send us hard copy through the tube. What were the shift patterns that were worked? In general it was usually 8 hours except it was a 10 hour shift because of a 1 hour overlap on each end. Some missions like the first lunar landing we worked 4 shifts with a specialised team that did descent and landing. In your book, you had admiration for Chris Kraft. Was your regard for Gene Kranz any less so? Chris Kraft was my boss, i was his deputy 4 times throughout my career, we were very close. Kranz was a systems guy and he finally admitted when he retired that he didn’t understand what we did down in the trench. it amazed him, he didn’t understand all that stuff. What I think we accomplished. Well we went from not being able to put anything in orbit to being able to send tons of sophisticated equipment that human beings a 1/4 of a million miles away would need to land on the moon in about 8 years, it was a very significant achievement. October 4th 1967, I was a freshman in college, scared me to death, I was driving home, I got home and my parents were even more scared that me. If they could do that, they could put a bomb up there. if they can deliver an 184 lb satellite into a pre-determined pattern by going 50 miles up in space, they could deliver to to a target anywhere on the Earth’s surface. We had to do something. A few weeks after Sputnik, we tried to put up a Vanguard into orbit but didn’t quite make it. NASA was eventually formed in 1958, they selected the first Mercury 7 astronauts and they got to witness a lot of those vehicle launches, studying the rockets they were going to go up on. This message was key to how we were to do this. That is one sentence, no fuzz, very succinct. It says what i want you to do and the schedule it needs to be done in. At that time we didn’t know how to do this at all. For example we didn’t know if we could do a direct launch and landing on the moon or rendezvous in Earth orbit to rendezvousing in lunar orbit. That’s when the space race really started. Unfortunately the Russians were first with Sputnik, the dog Laika in orbit, and the first EVA. Finally with Gemini 6 and a rendezvous with an Agena rocket, a decision was made to launch Gemini 7 with Frank Borman and Jim Lovell on a two week voyage to launch them first and rendezvous with Gemini 6. That was areal high point for us, we had finally beat the Russians. About 4 months later we did the first docking with Gemini 8 with Neil Armstrong and Dave Scott. The docking went great. It was getting towards the end of my shift, just prior to running out of ground contact, and when they came up over the next ground station they told us they were tumbling. To try and arrest the tumbling, Neil had to open up a secondary reactionary control system that was a back up. The mission rules were that if you had to use the back up, you had to come back down. They eventually came back down in the far west Pacific Ocean in the middle of the night. if you ever get a chance to talk to Dave Scott who was there he will tell you they were about to black out from the tumbling. Neil’s piloting control had no doubt, he had to bail out the lunar module trainer, called the flying bedstead. he landed, packed up his chute and just went back to the office and started writing his post flight report. He was just Mr Cool. Then we had a major setback withe the fire on Apollo 1, not only was it a great technical setback nut a personal one. These weren’t just astronauts, they were friends, our wives used to socialise, kids went to school together. Their families didn’t want us to slow down, wanted us to increase our efforts because that’s what the crew would want. Some people say that Apollo 13 was NASA’s finest hour, I have a hard time arguing with that except I really think that the time between the fire and the end of the Apollo 7 mission was only 21 months, completely redesigning the module to testing in orbit, that has to be something for NASA to be proud of. That is the most unheralded mission ever. The first manned flight of an Apollo spacecraft, if it hadn’t been successful we wouldn’t have landed on the moon. Gus Grissom and Wally Schirra, the Commander of Apollo 7, were very close friends, even before astronaut selection. Wally took it very personal, Gus had been complaining about the spacecraft and had even hung a lemon in it, Wally was determined he was going to fix everything that Gus had complained about. Wally Schirra had been told that he would have to test out a camera, he didn’t want to do that, for him that was public relations, not testing the spacecraft. Then he got a bad head cold, he was pretty grumpy, Walt Cunningham can tell you more about that. After about 6 days he started telling the flight director that he wasn’t going to listen to them anymore, he had his flight plan and knew what he was supposed to do. you can imagine that didn’t go down too well, they never went into space again. About a month before Apollo 7 flew, Gene Kranz, Cliff Charlesworth (another flight director) and myself were called up to Chris Kraft’s office and where George Low told us that if Apollo 7 was successful that he wants Apollo 8 to fly to the moon. We thought it was crazy, we knew that the lunar module was not going to be ready to fly the next flight, that would set the whole programme back and probably mean we wouldn’t meet the presidents goal. We started thinking what could we do to achieve the goal and we came up with of going into lunar orbit. Initially in the Mercury programme, I had been a Retrofire Officer before I became a Flight Dynamics Officer, and that return to Earth thing from lunar orbit was a Retrofire Officers responsibility which Chris Kraft asked me to do on this flight. This was my favourite flight, I was involved in so early, it was a bold move, surprised a lot of people at NASA and accomplished everything we planned. When the crew started reading the first chapter from Genesis on Christmas Eve, it was very emotional. Several years ago I jumped out of a perfectly serviceable airplane, parachuting, I sent pictures to a lot of people, i got an email back from Bill Anders who said “Oh my god we rusted you to get us back from the moon!” The other thing I liked about Apollo 8 is that it was everybody’s favourite crew, Jim Lovell was everybody’s favourite. Frank Borman was enormously respected and very instrumental in directing activity at North American Rockwell redesigning and rebuilding the Command Service Module. Zorbing in Nottingham – It’s How We Roll….